I wanted to shed some light on the role of stress and sleep in Hashimoto’s. We know that stress is never helpful, right? One of the earliest cases of thyroid disease was actually connected to a woman who was thrown down a flight of stairs in a wheelchair—how’s that for stressful! Over the last few years, I’ve had a chance to work with over one thousand people with Hashimoto’s and have found that most cases of Hashimoto’s involve stress…. You may really resonate with constantly feeling stressed out. If this is you, you need to know that the stress is not serving you. Stress puts us in a fight, flight, freeze, and break-down state, and shifts our body away from a rest, digest, relax and heal state. Healing happens when we are not stressed, and if you want to heal your body, I hope that having this awareness will empower you to change the habit of being stressed. Please note, while you may not be able to control the circumstances in your life, you can empower yourself on how you respond and react to them. I’ll write more about this one day soon! There are obvious sources of stress which include deadlines, traffic, a past history of trauma, and current stressful life situations. There are also not so obvious sources of stress, such as hidden infections, inflammation, and sleep deprivation. In this article, let’s cover sleep deprivation. The hypothalamic-pituitary-adrenal (HPA) axis is an intricate system of direct and indirect feedback mechanisms that regulate the body’s reaction to stress. The HPA axis plays a significant role in regulating the immune system, digestion, energy usage, mood, and sexuality. It is controlled by hormones which are altered when the body experiences stress. Sleep deprivation is such a powerful stressor for the HPA axis that it’s actually what scientists use to induce HPA axis dysfunction in laboratory animals! Most people with Hashimoto’s have some degree of adrenal fatigue (in fact, 90% of those I have tested do), and in my survey of 2000+ people with Hashimoto’s, “a lack of sleep” is the most frequently cited reason why people with Hashimoto’s feel worse. You may be sleep deprived simply because of the quantity of your sleep, or because you’re not sleeping enough. This could be due to insomnia, due to waking up too early, staying up too late, or even drinking too much caffeine, which prevents us from getting into the deeper and most restful sleep phases. You may also be sleep deprived because of the quality of your sleep. What’s surprising for many people is that they may even be sleep deprived if they’re sleeping enough hours… One of the reasons for poor sleep quality could be due to a silent condition known as sleep apnea. Over the last few years, three of my clients have presented with adrenal fatigue that just wouldn’t budge! They were struggling with their energy levels, and standard adrenal protocols of adaptogenic herbs, B vitamins, vitamin C, sleeping more, de-stressing—and even adrenal hormones weren’t helping! Sure enough, one of the clients had sleep apnea and refused to use her CPAP, one of the treatment devices for sleep apnea. Another one reported that she tended to snore, and a third one had a scalloped tongue, but they hadn’t been tested for sleep apnea, so I recommended that they get tested. Over the next 6 months, the two ladies with suspected sleep apnea were found to have it, and all three of them embarked on treatments for the condition. They reported that addressing their sleep apnea helped them feel significantly less tired and helped them to normalize their adrenal function and reduce their thyroid antibodies. Research has linked sleep apnea, an increasingly common cause of sleep deprivation, to Hashimoto’s. Studies have found that 25-35% of people with hypothyroidism also have sleep apnea. Now the question is… does hypothyroidism cause sleep apnea, or does sleep apnea cause hypothyroidism? 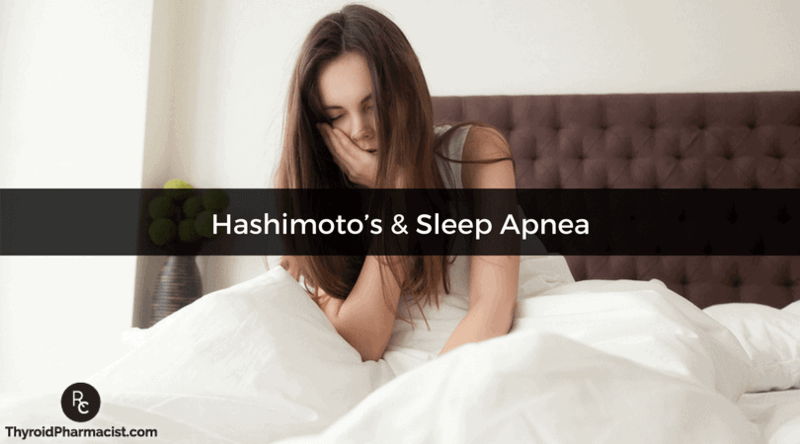 As with most triggers that are known to cause and exacerbate Hashimoto’s, it turns out that sleep apnea and Hashimoto’s are a bit of a vicious cycle situation. While hypothyroidism can cause sleep apnea due to protein deposition in the upper airway, increased risk of obesity, and abnormal control of ventilation, researchers wanted to know if obstructive sleep apnea (OSA) itself could be a potential trigger in Hashimoto’s. Males with sleep apnea were especially likely to have Hashimoto’s; 66% of men with sleep apnea had Hashimoto’s antibodies! People with sleep apnea and Hashimoto’s had a higher number of thyroid antibodies (compared to those with Hashimoto’s who did not have sleep apnea); those with OSA had TGAb in the 1,000 IU/ml range, while people without had TGAb in the 400 IU/ml range. Sleep apnea is a chronic health condition that has been associated with low-grade inflammation in the body and is characterized by pauses in breathing while one is sleeping. As these pauses in breathing and lack of oxygen wake people up intermittently throughout the night (though they don’t usually remember it), the result is often un-refreshing, fragmented sleep despite sleeping longer than usual. There are three types of sleep apnea: central sleep apnea, obstructive sleep apnea, and a mixed variation where elements of both types of sleep apnea are seen where the interruption in breathing happens because of a blockage of airflow. In CSA, the person stops breathing because of “forgetting” to breathe or a lack of effort in breathing. The most common type of sleep apnea is obstructive sleep apnea, or OSA. Obstructive sleep apnea affects about 2-9% of women and as many as 24% of men. Risk factors for sleep apnea include obesity, enlarged tonsils, enlarged tongue, having a small jaw, allergies, sinus problems, a deviated septum, and acid reflux. The classical symptoms of sleep apnea include snoring, difficulty in waking up, restless sleep, nasal speech, mouth breathing, attention deficit disorder (especially in children), fatigue, and nasal congestion. Please note, not all of these need to be present for a person to have sleep apnea. Furthermore, a scalloped tongue, which is often seen in thyroid disease, has also been correlated with sleep apnea. What is a scalloped tongue? A scalloped tongue happens when a person’s tongue is too big for their mouth and spends too much time resting against one’s teeth. The scalloped tongue has ridges and wavy edges around its borders and is frequently seen in those with Hashimoto’s and hypothyroidism. In a 2005 study, Weiss and colleagues were able to compare the rates of sleep apnea and scalloped tongue. They found that 70% of people with sleep apnea had tongue scalloping, while only 1 person of the 7 people in the control group (without sleep apnea) had a scalloped tongue. Furthermore, on a scale of scalloping from 0-3, with 3 being the most severe, the person without sleep apnea had a scalloping rating of 1, the lowest of the rating. The researchers did not specify whether the higher degree of scalloping was predictive of higher rates of sleep apnea, but I would encourage anyone with a scalloped tongue to get checked out. People who snore at night and/or have a scalloped tongue should be suspected to have sleep apnea until proven otherwise! Sleep studies are considered the most reliable testing for sleep apnea and other sleep disorders. A sleep study involves sleeping at a specialized lab where the person’s vital signs, brain activity, and breathing patterns are recorded and monitored. The most well-known treatment for sleep apnea is the continuous positive airway pressure (CPAP) machine, which is used to maintain breathing. My clients have also reported benefits from using a dental device (known as a mandibular advancement device), which is a type of retainer-like appliance that is worn overnight to gently open airways. CPAP stands for “continued positive airway pressure” and is a non-surgical therapy usually used as the first line of treatment for obstructive sleep apnea. It is a small machine that uses mild air pressure in order to keep your airways open while you sleep. It contains a mask that goes over the nose and mouth, so it may take some getting used to! However, it is the chosen treatment for severe cases of sleep apnea for a reason. When used correctly and consistently, it is extremely effective in cutting down on daytime sleepiness; reducing or eliminating snoring; lessening chances of cardiovascular problems and stroke; improving cognitive function and memory; and, as I mentioned, treating sleep apnea is an important step in addressing symptoms of Hashimoto’s and hypothyroidism. I also recommend digging for additional root causes like food sensitivities, nutrient deficiencies, and infections that could contribute to symptoms of sleep apnea and Hashimoto’s and really looking at the body as a whole. First and foremost, we have to start with nutrition. Eating an anti-inflammatory diet, like the Autoimmune Paleo diet, can help reduce some of the inflammation that may be correlated with sleep apnea, and figuring out your nutrient deficiencies can improve how you feel, as well as potentially improve the sleep apnea. A 2012 case study reported that a 24-year old who received treatment for Leigh disease, a neurological condition, had an improvement in not just the Leigh disease symptoms but also showed an improvement of his sleep apnea documented by a sleep study that occurred one year after his initial diagnosis and treatment plan was started. Interestingly, the recommended treatment for Leigh’s disease consists of many nutrients I already recommend for people with Hashimoto’s, including CoQ10, thiamine, carnitine, vitamin C, and vitamin E.
Thiamine, specifically, has been a life-changing nutrient for many people with Hashimoto’s. Read more about thiamine in this article. As enlarged tonsils can be a trigger for sleep apnea, and the Epstein-Barr virus can cause enlarged tonsils, I recommend testing for Epstein-Barr and other infections to determine if they are the cause for the enlarged tonsils, which could then contribute to sleep apnea and/or Hashimoto’s. You can read more about Epstein Barr in this article. You can find more information about root cause testing including a questionnaire to help you prioritize in the Advanced Protocols of Hashimoto’s Protocol. Your feedback helps me to help others! Do you have a scalloped tongue? Have you been tested for sleep apnea? Have you considered sleep apnea as a possible root cause? If so, what has worked for you to address sleep apnea? Because it is so prevalent among those with Hashimoto’s, I recommend that you get tested for sleep apnea, especially if you snore or have a scalloped tongue. To discover additional root causes, please consider joining my Hashimoto’s Self-Management Program or pick up a copy of Hashimoto’s Protocol: A 90-Day Plan for Reversing Thyroid Symptoms and Getting Your Life Back and Hashimoto’s Thyroiditis: Lifestyle Interventions for Finding and Treating the Root Cause. For continued updates and interaction, please become a part of our Facebook community and sign up for our newsletter. Bozkurt N, Karbek B, Cakal E, Firat H, Ozbek M, Delibasi T. The association between severity of obstructive sleep apnea and prevalence of Hashimoto’s Thyroiditis. Endocrine Journal. 2012;59(11):981-988. doi:10.1507/endocrj.ej12-0106. Magrini A, Pietroiusti A, Coppeta L et al. Shift Work and Autoimmune Thyroid Disorders. International Journal of Immunopathology and Pharmacology. 2006;19(4):31-35. Mermigkis C, Bouloukaki I, Mastorodemos V et al. Medical treatment with thiamine, coenzyme Q, vitamins E and C, and carnitine improved obstructive sleep apnea in an adult case of Leigh disease. Sleep and Breathing. 2013;17(4):1129-1135. doi:10.1007/s11325-013-0816-5. Mete T, Yalcin Y, Berker D et al. Relationship between obstructive sleep apnea syndrome and thyroid diseases. Endocrine. 2013;44(3):723-728. doi:10.1007/s12020-013-9927-9. Raff H, Ettema S, Eastwood D, Woodson B. Salivary Cortisol in Obstructive Sleep Apnea: The Effect of CPAP. Endocrine. 2011;40(1):137-139. doi:10.1007/s12020-011-9474-1. Serra-Torres S, Bellot-Arcís C, Montiel-Company J, Marco-Algarra J, Almerich-Silla J. Effectiveness of mandibular advancement appliances in treating obstructive sleep apnea syndrome: A systematic review. The Laryngoscope. 2015;126(2):507-514. doi:10.1002/lary.25505. Weiss T. Association of tongue scalloping with obstructive sleep apnea and related sleep pathology. Otolaryngology – Head and Neck Surgery. 2003;129(2):P179-P180. doi:10.1016/s0194-5998(03)01047-7. White D, Shafazand S. Mandibular Advancement Device vs CPAP in the Treatment of Obstructive Sleep Apnea: Are they Equally Effective in Short Term Health Outcomes?. Journal of Clinical Sleep Medicine. 2013. doi:10.5664/jcsm.3008. I have what you describe and found your article most helpful. I will share this with the practitioners I have been seeing. Please list as helpful additions to your healing protocol for sleep apnea, scalloped tongue (and thyroid disease) : Oral Facial Myofunctional therapies. I go to a dental hygienist who is also an OMT… She has given me many exercises that help strengthen the tongue and neck and throat so that the symptoms of sleep apnea are lessened. Thank you for your generosity of spirit in this work. Ann – thank you for following this page and for sharing what has worked for you. 🙂 You might also be interested in my books. Do you I know of a website to find a dentist who will do Mandibular Advancement Device? Sandy – thank you for following this page. I highly recommend a Biological dentist. Biological dentistry is a branch of dentistry that looks at the connection between oral care and the health status of the rest of the body. While most traditional dentists focus only on “rescue care” rather than prevention, biological dentists try to prevent health problems that may originate from exposure to certain procedures and materials. To find a biological dentist in your area, visit the International Academy of Oral Medicine & Toxicology’s website at http://www.iaomt.org for a listing. Jude – Thank you for following this page. I am happy you are taking charge of your health and have found a good doctor. Most thyroid conditions result from the immune system attacking the thyroid because the immune system is out of balance. Even when the thyroid is taken out surgically, is ‘dead’, or treated with radioactive iodine the autoimmunity still persists in most cases. Many people will have their thyroids removed, and will develop new autoimmune disorders such as Lupus, Rheumatoid arthritis, etc. The immune system just finds a different target. We need to re-balance the immune system to prevent this (sometimes the autoimmunity can be reversed as well). The gut determines your immune system. With the exception of discussing proper thyroid medication dosing, the majority of my website and my book focuses on balancing the immune system. The info I present is based on my own research and journey for overcoming my autoimmune thyroid condition. I have been diagnosed with obstructive sleep apnea and hashimoto’ (30 yrs). I cannot stand the CPAP machine. It is uncomfortable and the mask on a hot summer day made me feel I was suffocating. I did get fitted with a dental appliance but I am unsure of wether it works. My morning blood pressure is elevated as well as having a headache on a bad day. I do have high nighttime cortisol. I am at my wits end trying to fix the sleep apnea. I even place tennis balls on my back to keep me from sleeping on my back which is when I stop breathing. Any suggestion? Theresa – thank you for following this page. When people have adrenal struggles, we often see that their release of cortisol is altered. People with healthy adrenal function release the most cortisol in the morning. People with impaired adrenal function may wait to release their cortisol at the end of the day. Taking an adrenal adaptogen like the Rootcology Adrenal Support or the Pure Encapsulations Daily Stress Formula in the mornings can help. Additionally, I recommend going to bed before you experience that energy rush. If it comes around 10pm, going to bed around 9pm would greatly help your adrenals. Having Hashimoto’s can feel very stressful. Having out of range thyroid hormones, adrenal fatigue, negative food sensitivities and low nutrient levels can lead to feelings of anxiety, hopelessness and stress. Treating these issues one at a time is the best plan of action. You can recover and regain your health! My new book Hashimoto’s Protocol is a step by step guide to the interventions that helped 80% of the people 80% of the time. I hope you check it out. Dr. Wentz, I absolutely love and admire you form the work you do. I’ve had hypothyroidsm for 15 years. A year afo I became devastatingly sick and went on your autoimmune paleo diet and my health turned around completely. A month after starting the diet I went to a new doctor who tested my antibodies, something no other doctor had done, and I tested negative. Does that mean that Hashimoto’s isn’t causing my hypothyroidism? Or that I managed to lower my antibodies through your protocol before I even got tested? Thank you in advance. Natalie – thank you so much for your support! – Some people with Hashimoto’s test negative for thyroid antibodies because their overall immune health is so weak they do not produce enough antibodies. I’ve tested negative for antibodies several times. Now I’ve insisted on a thyroid ultrasound. Given that Hashimoto’s is one of the leading causes of hypothyroidism worldwide, I wouldn’t stop until I know one way or another. Shirley – thank you for following this page. One of the best—and easiest—places to start is your sleep and self-care routine. Going to bed on time (not past 11pm) and supplementing with magnesium citrate (most people are deficient in this element) can help your body prepare for the rest of the protocols needed on your journey to health. Having Hashimoto’s can feel very stressful. Having out of range thyroid hormones, adrenal fatigue, negative food sensitivities and low nutrient levels can lead to feelings of anxiety, hopelessness and stress. Treating these issues one at a time is the best plan of action. You can recover and regain your health! My new book Hashimoto’s Protocol is a step by step guide to the interventions that helped 80% of the people 80% of the time. I hope you check it out. I have found it so hard to get all my ducks in a row in treating my Hashimoto’s and adrenal disregulation. But, wow, this is a big duck. I haven’t slept well for years. My cortisol is high at night and low in the morning. I wake up a lot during the night and often have trouble falling back to sleep once I’ve slept for 5 hours. I was just thinking that maybe something else is going on so I Googled sleep apnea and Hashimoto’s and this article popped up. I have a scalloped tongue and it always feels a little swollen. I’m asking my doctor for a sleep study referral this week. This gives me hope. Thank you! Mary – thank you for following this page. When people have adrenal struggles, we often see that their release of cortisol is altered. People with healthy adrenal function release the most cortisol in the morning. People with impaired adrenal function may wait to release their cortisol at the end of the day. Taking an adrenal adaptogen like the Rootcology Adrenal Support or the Pure Encapsulations Daily Stress Formula in the mornings can help. Additionally, I recommend going to bed before you experience that energy rush. If it comes around 10pm, going to bed around 9pm would greatly help your adrenals. Having Hashimoto’s can feel very stressful. Having out of range thyroid hormones, adrenal fatigue, negative food sensitivities and low nutrient levels can lead to feelings of anxiety, hopelessness and stress. Treating these issues one at a time is the best plan of action. You can recover and regain your health! My new book Hashimoto’s Protocol is a step by step guide to the interventions that helped 80% of the people 80% of the time. I hope you check it out. You also may be interested in this article I wrote. ARE YOUR ADRENALS SABOTAGING YOUR HEALTH? Have you researched the connection between the Anthrax vaccine and Hashimoto’s or other autoimmune disorders? I was perfectly healthy until about a year after getting the 5th Anthrax vaccine while in the military. I developed a rash that was all over my body that could not be explained that comes back to this day (15+ years later) and have since been diagnosed with Hashimoto’s, Fibromyalgia, PCOS and I was Type 2 Diabetic. Nobody in my immediate family has any of these disorders, just me. And, while my brother was in the military, he was never given the Anthrax Vaccine. Angel – thank you for following this page. While I only work with patients with Hashimoto’s, oftentimes patients will have additional autoimmune conditions. Most autoimmune conditions have common root causes, and a lot of times the things that are recommended for one autoimmune condition will help with others. Conditions that I have found to respond really well to the Hashimoto’s protocols have been rheumatoid arthritis, lupus, Celiac disease, irritable bowel syndrome, eczema, asthma, Graves’, premature ovarian failure, psoriasis, Alopecia Areata, and Sjogrens. I have also seen the protocols help with Fibromyalgia, chronic fatigue syndrome, PCOS, as well as Type 2 diabetes, Crohn’s, and Ulcerative colitis. I was fascinated by The Thyroid Secret and immediately implemented a lot of your suggestions back in February 2017. After just 3 months my TSH had fallen from a 6 to a 1.12. One of the unexpected consequences was that I stopped snoring. I’m hoping this might mean there’s hope for the underlying cause of my sleep apnea being cured. Do you know of cases where it’s been reversed? Kim -Thank you so much for following this page. Here is some information which you may find interesting. I have had a scalloped tongue for years, I remember my husband asking me about it when we met and that was 12 years ago and I had had it for ages prior to that. I have Hashimotos and have had a full thyroidectomy due to cancer. I really feel that once my tongue presents as normal, I will be well again. My oncologist said I am pushing my tongue up against my teeth, and it’s stress related. A functional doctor said too much of my T4 was staying in my tissues. Interestingly, the indentations vary throughout the day and are at their worst when I wake in the morning. I continue to search for the reasons. Lilly – thank you for following this page. Most thyroid conditions result from the immune system attacking the thyroid because the immune system is out of balance. Even when the thyroid is taken out surgically, is ‘dead’, or treated with radioactive iodine the autoimmunity still persists in most cases. Many people will have their thyroids removed, and will develop new autoimmune disorders such as Lupus, Rheumatoid arthritis, etc. The immune system just finds a different target. We need to re-balance the immune system to prevent this (sometimes the autoimmunity can be reversed as well). The gut determines your immune system. With the exception of discussing proper thyroid medication dosing, the majority of my website and my book focuses on balancing the immune system. The info I present is based on my own research and journey for overcoming my autoimmune thyroid condition. I recently read that many biological dentists are “stepping up” and are now routinely screening for sleep apnea. They are already in the mouth and it is a natural progression from there. I think this is a positive move. I meet with a new biological dentist in a few weeks and this is one of the questions I am asking him. “Do you routinely screen for sleep apnea in your patients?” Now I am also going to ask him about the scalloped tongue question too. Thank you! Hi there I am reading Hashimoto Protocol as a friend suggested it a couple of weeks ago. I have been diagnosed with auto immune disorder and told most of the “other things” going on relate, brain fog, chronic fatigue, snoring, weight gain, psoriasis arthritis, dry itchy watering eyes, blefuritius and many more. It is really impacting on my life and I have dropped a day from work because I am always exhausted, I am with a regular doctor who is great and sympathetic, but I am frustrated. While reading your book I have so many of the symptoms you mention, a huge amount, I live in New Zealand and am not sure where to go next? I tried the auto-immune diet but found it a bit boring, but I need a o do something. I am in m late 50’s and wan to enjoy life for many more years yet. Judi – thank you for following this page. Did you know that reactive foods trigger an inflammatory response in the GI tract, leading to malabsorption of nutrients (gluten sensitivity in particular has been implicated in causing a Selenium deficiency, a well known risk factor for Hashimoto’s), and can also produce intestinal permeability whenever they are eaten? I just received my diagnosis on Wednesday. I was switched to the nature throid at a higher dosage. I am happy to know why I have felt the way I do and have had all of these various conditions for the past 10 years. But I am wondering how important the dietary changes are. My husband had mentioned just letting the pills do their job and see what happens but the more I read about hashimotos, the more I feel like cutting out certain things and adding in others is crucial to being able to live comfortably with this diagnosis. I started having symptoms when I was pregnant with my diaghter. I developed restless legs and had some blood sugar issues during oreganacy. With my last pregancy, 4 years ago, I had no energy during and after and when she was born and I tried nursing, I couldn’t produce much. (I had no problem producing web nursing my first 2 just a few years before) I recently read that breast milk production is hindered by low thyroid hormones. I have asked several doctors in the past to check my thyroid but once I finally decided to see an endocrinologist, I was able to get an explanation for the fatigue, weight gain, moods, forgetfulness, etc. I work out 6 days a week, fairly aggressively, and haven’t been able to lose the fat. I understand why now. I have requested a copy of your book- the lifestyle changes one- and I am hoping to find some more information to help me and my husband understand what we are dealing with. I have thought of going gluten, dairy and soy free but my husband isn’t convinced that’s the answer, considering that would be a household change. I am open to suggestions and questions to help better understand this disease and what ways are best to maintain. Thanks! Amanda – Thank you for following this page. Did you know that reactive foods trigger an inflammatory response in the GI tract, leading to malabsorption of nutrients (gluten sensitivity in particular has been implicated in causing a Selenium deficiency, a well known risk factor for Hashimoto’s), and can also produce intestinal permeability whenever they are eaten? I went through a sleep study and found I have sleep apnea. My tongue fall back in my throat and cuts off the air. I am currently using the OMAD because I just didn’t want to be connected to a CPAP. So far, I have had no improvement in my sleep. I still wake up just as exhausted as when I went to bed. After 1.5 years of no decent sleep I am so desperate for it. I will have a repeat study done at the 1 yr mark of the first one and will have to see what that says. Just discovered your blog and I’m finding it really helpful. I do have the scalloped tongue, Hashimoto’s and sleep apnea. Nancy – Thank you for following this page. Did you know that reactive foods trigger an inflammatory response in the GI tract, leading to malabsorption of nutrients (gluten sensitivity in particular has been implicated in causing a Selenium deficiency, a well known risk factor for Hashimoto’s), and can also produce intestinal permeability whenever they are eaten? I have a scalloped tongue (I just checked!) and confirmed and treated sleep apnea. I wear my APAP (which I recommend over CPAP) every night. in fact, I sleep better with the APAP than without it. Trouble is, I haven’t slept well without a sleep aid since I quit smoking 9 years ago. I there a connection between smoking, sleep deprivation and thyroid issues? And what do I do to fix it? Everything went haywire when I quit. I don’t really know if I have hashimoto’s because my labs are all coming back in range. On the low end, but in range. I do have some kind of thyroid issue as I’m on NP thyroid, but my symptoms continue. Especially the insomnia. It’s the WORST. Tamian – thank you for following this page and for sharing your experience. Here is an article I wrote that you might find helpful. Hi Tamian- I also quit smoking in July of 2014 after smoking for 20+ years. After I quit smoking, the following January after a stressful family move, I was diagnosed with Hoshimotos hypothyroidism. A year later with Premature Ovarian Failure. Now I am dealing with pre diabetes. So to answer your question, yes I believe quitting smoking triggered something. Hope you do well on your journey and feel better! Laurel – thank you for following this page and for sharing! <3 While I only work with patients with Hashimoto’s, oftentimes patients will have additional autoimmune conditions. Most autoimmune conditions have common root causes, and a lot of times the things that are recommended for one autoimmune condition will help with others. Conditions that I have found to respond really well to the Hashimoto’s protocols have been rheumatoid arthritis, lupus, Celiac disease, irritable bowel syndrome, eczema, asthma, Graves’, premature ovarian failure, psoriasis, Alopecia Areata, and Sjogrens. I have also seen the protocols help with Fibromyalgia, chronic fatigue syndrome, PCOS, as well as Type 2 diabetes, Crohn’s, and Ulcerative colitis. Sorry for the double post. The second one is correct. I use an APAP (automatic pressure) my husband uses the ByPAP, and agrees the CPAP is not good. The continuous pressure made him feel like he was suffocating. Couldn’t breathe out. ByPAP fixed that. And I’ve never had that problem with the APAP. Perhaps your readers who resist the machine might like to know that. My dentist says that the MAD can permanently change a person’s bite. To me that is scary. My endocrinologist has ordered a sleep study though. Do you know of any reputable sleep apps? I have an Apple Watch and wanted to monitor that way first. Kerri – thank you for following this page. I am sorry I do not have any information apps for monitoring sleep to share with you at this time. I recommend digging for additional root causes like food sensitivities, nutrient deficiencies, and infections that could contribute to symptoms of sleep apnea and Hashimoto’s and really looking at the body as a whole. I also recommend testing for Epstein-Barr and other infections to determine if they are the cause for the enlarged tonsils, which could then contribute to sleep apnea and/or Hashimoto’s. Here are some articles you might also find helpful. I’m really enjoying everything you teach and I have started your newest book. The reason why I don’t he enough sleep is because I’m in the toilet 3 or 4 times in the toilet,and even that I go back to sleep,I have broken sleep and feel tired all the time. Barbara – thank you for following this page. I highly recommend that you work with a functional medicine clinician to be a part of your own health care team. It’s an entire medical specialty dedicated to finding and treating underlying root causes and prevent serious chronic disease rather than treating individual disease symptoms. I have had a scalloped brownish black tongue for 5 years. I have seen huge improvement doing the RC Liver Reset. I am doing the advanced list eliminating everything possible. I have not yet started supplements as I have been addressing SIBO and am now taking 15 Wobenzyme tablets, plant enzymes, Betaine with Pepsin, Selenium, Magnesium and numerous other vitamins daily as recommended by my ND. I am up to 2 smoothies a day. My tongue is looking normal this for the first time in 5 years. Although this new normal comes and goes, it continues to improve daily. I am still working at SIBO hoping it is finally gone this time. My histamine intolerance is still annoying when I eat an offensive food and don’t take enough DAO. It causes me to shiver all evening and wake up with a pounding heart around 3 AM. The pounding heart continues to 5 or 6 AM when I can finally sleep again. When I avoid histamine I do wake up refreshed now that I am following a suggestion from a workshop I went to a few days ago. When I wake now, I visualize my happy places including how it sounds, smells, what I hear etc. This puts me right back to sleep! Thank you so much for analyzing our collective wisdom and sharing your insights so articulately. I am a 48 year old male. Have struggled with autoimmune for 19 years – first Membranous glomerulonephritis (which lead to pulmonary embolism) then Hashimoto’s. I’ve been reading your blog and have started the AIP diet. I was just wondering how terrible it would be to not exclude caffeine but to religiously adhere in every other area? Thanks for this great resource! Frank, thank you so much for sharing your journey. Coffee is technically a seed, so even decaf is off the menu with the Autoimmune Paleo diet. That said, the Autoimmune Paleo diet is meant to be an elimination diet where you discover your reactive foods and allow your body a break from too many difficult-to-digest proteins as you work on a comprehensive plan to heal your body. You may find these articles helpful. Hi Dr. Wentz, I have been struggling with incurable adrenal fatigue and was diagnosed with hypothyroidism in July. I had negative antibodies and my ultrasound showed no signs of Hashimoto’s. Is it possible I still have it? I have a scalloped tongue and I also notice that my jaw seems to get out of place (moving left or right) when I’m sleeping. It wakes me up sometimes. So I guess there are two ways that maybe my airway is being blocked. I also feel that pills seem to get stuck in my throat sometimes and I do have a goiter. I have severe, chronic insomnia and when I do sleep, I have very low levels of deep sleep. I have low cortisol all day and then high at night. I’ve been doing everything recommended for lowering cortisol in the evening to no avail. I also had my neurotransmitters tested and it came back low for serotonin, GABA, dopamine, epinephrine and norepinephrine. Is it possible that sleep apnea could affect those? Or is it just the adrenal fatigue/hypothyroidism causing low levels? Melatonin does nothing for me, but 5HTP has been helping a bit. I have a sleep study this weekend so I’m hopeful I might get some answers soon. Koda – thank you for reaching out. Some people with Hashimoto’s test negative for thyroid antibodies because their overall immune health is so weak they do not produce enough antibodies. I’ve tested negative for antibodies several times. Now I’ve insisted on a thyroid ultrasound. Given that Hashimoto’s is one of the leading causes of hypothyroidism worldwide, I wouldn’t stop until I know one way or another. When people have adrenal struggles, we often see that their release of cortisol is altered. People with healthy adrenal function release the most cortisol in the morning. People with impaired adrenal function may wait to release their cortisol at the end of the day. Taking an adrenal adaptogen like the Rootcology Adrenal Support or the Pure Encapsulations Daily Stress Formula in the mornings can help.Additionally, I recommend going to bed before you experience that energy rush. If it comes around 10 pm, going to bed around 9 pm would greatly help your adrenals. Having Hashimoto’s can feel very stressful. Having out of range thyroid hormones, adrenal fatigue, negative food sensitivities and low nutrient levels can lead to feelings of anxiety, hopelessness, and stress. Treating these issues one at a time is the best plan of action. You can recover and regain your health! My new book Hashimoto’s Protocol is a step by step guide to the interventions that helped 80% of the people 80% of the time. I hope you check it out.